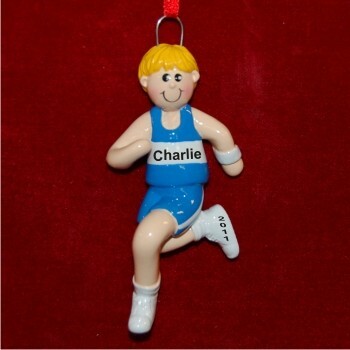 This athletically designed male blond running personalized Christmas ornament is perfect for young men participating in cross country, track or road races like 5K and 10K events. These sports ornaments personalized for the recipients become special keepsakes when customized with his name and the year. Our lettering artists will add the details by hand in a font more stylish than the one shown for clarity to make these personalized runner gifts that will be enjoyed in the years ahead. We include a display cord with the male blonde runner personalized Christmas ornament that arrives in our handsome velvet gift and storage pouch. Christmas gift Dec 11, 2017 Brooke C.
For our miler grandson Dec 27, 2014 Jorge G.